SEOUL, Sept. 19 (Yonhap) — Samsung Electronics Co. on Monday initiated its replacement program for Galaxy Note 7 phablets in South Korea in collaboration with local mobile carriers as part of its global recall of the new smartphones, industry officials said. Customers of the nation’s three mobile carriers — SK Telecom Co., KT Corp. and LG Uplus Corp — began exchanging their Galaxy Note 7s for new ones at outlets across the country after receiving mobile notifications from the carriers, said the officials. Old Galaxy Note 7s were swapped with new ones of the same color at no extra cost, they added. 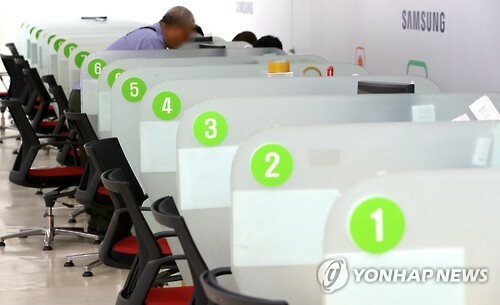 The notices were given out by subscription date to ease congestion in the first week, they said, noting incumbent Galaxy Note 7 users will also have to decide whether to choose a refund or a cancellation of their subscription by Monday. About 400,000 Note 7 smartphones are estimated to have been sold in South Korea so far. On the first day of the replacement program, users of the Note 7 appeared to be in no hurry to swap their handsets with new ones. Samsung said it had supplied 100,000 new Note 7s to the three mobile carriers as of Monday morning. About 20,000 smartphones were believed to be replaced as of Monday evening. Samsung said it would supply the remaining 300,000 new Note 7s by the end of this month. Samsung said it expects to resume normal sales of new Galaxy Note 7 devices in South Korea starting Sept. 28 after completing the replacements of approximately 400,000 units by the end of this month. Earlier this month, Samsung Electronics announced a massive recall of its latest Galaxy Note 7 phablet, following its launch in 10 nations on Aug. 17, after dozens of consumers reported battery fires. The flagship device reached stores in the United States, Canada, Taiwan, Mexico and Australia. Samsung Electronics has asked Galaxy Note 7 users to get replacements by the end of September, although the recall will run through March next year. Samsung said it will provide about 400,000 new Galaxy Note smartphones, with 100,000 new devices being available in stores on Monday. Samsung will then supply an additional 50,000-60,000 replacement phablets each day. I also think that hard work is the most important aspect of getting success..